I had the opportunity to attend the Georgia Budget and Policy Institute’s (GBPI) 2015 Policy Conference on Wednesday, January 7th, 2015. The conference revealed a lot about the actual state of affairs happening in Georgia, which is exactly what GBPI does as an organization. GBPI, a ten year old organization, thoroughly analyzes Georgia’s budget and tax policies to inform public and local leadership. Their research is meant to be used as a tool which will hopefully benefit the state. The Policy Conference consisted of two panels that discussed K-12 education issues in Georgia and another about healthcare coverage across the nation along with author Bob Herbert as the keynote speaker. The Education Plenary: Emerging Issues in Education panel consisted of four men who were there to not only discuss school funding but also key emerging issues in Georgia’s K-12 system. Rep. Mike Dudgeon, vice chairman of the Education Committee in the Georgia House of Representatives; Sen. Lindsey Tippins, chairman of the Georgia Senate’s Education and Youth Committee; Rep. David Wilkerson from Cobb County; and Richard Woods, Georgia’s new state school superintendent. Education remains at the forefront of Georgia’s budget and policy debate. 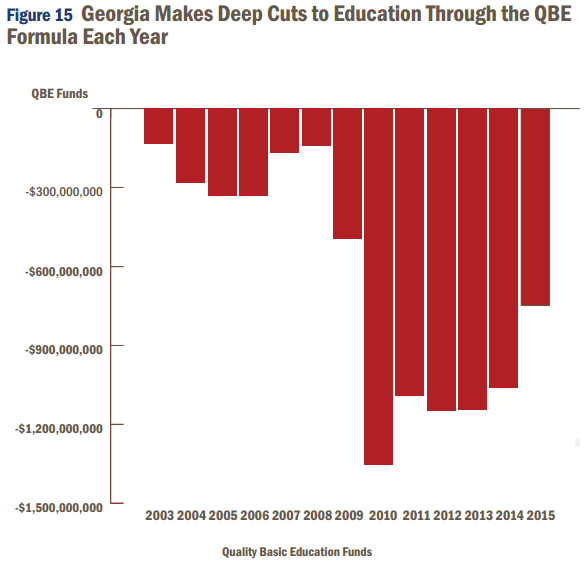 After suffering significant cuts since the Great Recession, Georgia’s K-12 formula is still underfunded by $746 million in 2015 (see chart below). All of the panelists agreed that something needs to change in Georgia’s schools whether it is funding or curriculum, business as usual will not suffice for Georgia’s schools. One of the major areas of agreement all four panelist favored is increasing Science, Technology, Engineering, and Math (STEM) education in Georgia’s schools. There’s a good reason for this backing. STEM occupations are expected to grow 17% by 2018 and get paid more than their non-STEM counterparts by 26% according to the U.S. Department of Commerce. While I could go on and on about STEM education, there were other very important topics discussed regarding the school system in Georgia: high school graduation rates (Georgia is 40th in the nation), school funding (see graph below) and readjusting the state’s K-12 formula, Common Core, and teacher and parent responsibility. The latter, by far, was the most passionate discussion I have ever witnessed. Teachers and administration were both present in the audience which made for a very insightful discussion, and rightfully so, not only do teachers have to deal with stressful teacher evaluations and “teaching to the test,” but also with financial support that remains below pre-recession levels. As Richard Woods pointed out, only half of Georgia’s teachers don’t make it past their fifth year. 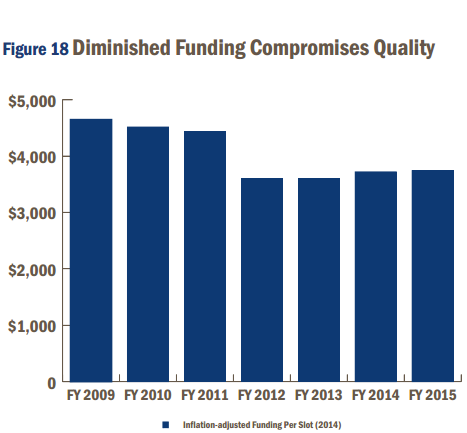 The first chart above and the second one below both illustrate that while 2015 funding won’t be as bad as previous years, it’s still worse than where we were pre-recession and need to be. Healthcare is also another important topic to Georgia’s budget and policy debate. The state has chosen to forgo Medicaid Expansion and, as a result, have lost billions in federal support. The Healthcare: Closing Georgia’s Coverage Gap panelists included Jason Bailey from the Kentucky Center for Economic Policy and Adam Searing from the Georgetown University Center for Children and Families. Jason Bailey discussed how Kentucky, a conservative state, was able to expand Medicaid coverage as well as the depth of Kentucky’s implementation of the Affordable Care Act, most notably its health insurance exchange Kynect. Kynect is a user friendly website that helps Kentuckians find affordable health care and has been widely used and accepted. Providing Kentuckians with quality healthcare and not lose out on the funds being given to the state was the motivation behind Kentucky leadership’s decision to expand it. To understand the repercussions the state and the people of Kentucky could have faced if Medicaid was not expanded, click here. Adam Searing provided a national overview of Medicaid expansion, as well as some insight into different approaches states, especially conservative ones, are using to pass Medicaid expansion. One examples is Utah, where a coalition of civic leaders including local chambers of commerce, hospitals, and religious institutions along with the governor banded together to support expansion within the state. More importantly, Searing noted that Medicaid expansion is not one size fits all, the federal government has established a great amount of flexibility including shared costs structures. He also noted that states, on average, saw a 30 percent drop in uncompensated care with the expansion of their Medicaid program along with the community health benefits the expansion provides. Both education and Medicaid expansion had an underlying theme that was not apparent until the Keynote speaker, Bob Herbert – author of Losing Our Way, took the stage to discuss wealth and income disparity between the rich and those living in poverty. He made us think about a “living” wage and minimum wage, about how one third of the population is either poor or near poor, and where the disconnect is between leadership and the people they represent. Perhaps the most poignant part of his keynote address came when he read a passage from Losing Our Way, the story of a 19 year old girl, Jessica Gallardo, who worked in a bakery manufacturing operation. The teen worked nights, including school nights, often till 1 a.m. in order to help provide shelter for her family. Conditions in the factory were grueling; employees often didn’t take lunch or bathroom breaks – instead favoring to stay on the manufacturing line until their shift ended. Needless to say, Jessica had trouble paying attention in class, let alone doing her homework. With the example and so many more listed in his book, Herbert believes that change starts with the public voice. Herbert’s call to action against disparity is for us, the community, to challenge the local leadership and make them take notice in what we believe needs to be changed. “Believe passionately about your cause, it’s our America”, he says. One of the key takeaways that was repeated time after time by each presenter/panelist is that leadership needs to recognize their states strengths and weaknesses. State budgets are not just numbers on a spreadsheet but directly affect its citizens’ wellbeing. That should be the main concern for each state representative and community stakeholder. How can you tell if wages are really low?